Interviewing is one of the most common techniques used to conduct qualitative research in the social sciences and humanities. As a result of globalization, researchers increasingly conduct interviews cross-, inter- and intra-nationally. This raises important questions about how differences and sameness are understood and negotiated within the interview situation, as well as the power structures at play within qualitative research, and the role that reflexivity plays in mediating these. What does it mean to interview Black women as a Black woman? How is ethnicity negotiated across various qualitative research encounters? How are differences bridged or asserted in feminist interviewing? These are just some of the questions explored in the chapters in this volume. Drawing on their recent research, the contributors detail their experiences of engaging in qualitative interviewing and examine how they negotiated the various dilemmas they encountered. The contributions challenge some of the assumptions made in early feminist work on interviewing, providing nuanced accounts of actual research experiences. 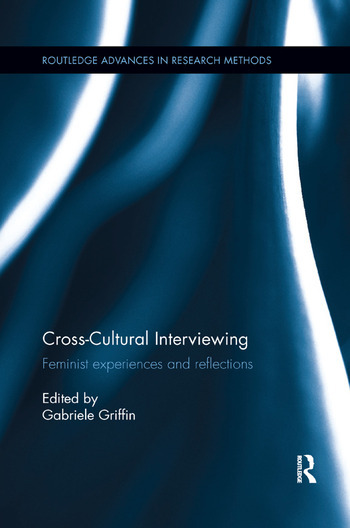 This volume explores the practice and implications of conducting cross-, inter- and intra-cultural interviewing, bringing together researchers from a range of disciplines and countries to describe and analyse both its vicissitudes and its advantages. Gabriele Griffin holds the Anniversary Chair in Women’s Studies at the University of York, UK. Her research centres on contemporary women’s cultural production, Women’s Studies as a discipline, and research methods.